A few months ago, my blog friend Ashten asked on Twitter where she should be shopping. Since I have a million opinions on this matter, I obviously had some places to share… too many for Twitter even. So many, in fact, that I sent her way too long of an email with all of my recommendations. And then I realized… this would make a good blog post, because I bet others are looking for new places to check out too. I did a little more research and combed my inbox and web history to see where I had been shopping recently. 1. Thredup – I first discovered ThredUp when they were running some sort of promo last Black Friday for $20 off your first order. After shipping, I got a brand new coat for $8. Yep, amazing. They just sent me a coupon code for 40% off an entire order too which is awesome (use code ” “) and if you use my referral link, we both get $10! 2. Poshmark – I use Poshmark to sell, but they also have a HUGE community of ladies selling in their own closets too. I’ve actually sold quite a bit through them – but I will say, it’s a bit of work to share your listings and get your closet items noticed. It’s also great for shopping, I may or may not be stalking a few fancy bags and my favorite Madewell jeans. Sign up with code “BIEGV” and we both get $5! 3. Golden Tote – This is one of my favorites, just because it’s basically like having a personal shopper, but you also get to pick a few items. So to break it down, choose between a $49 tote or $149 tote. If you chose $49, you choose one item from their monthly selection, and they will surprise you with 1-2 additional items. If you choose a $149 tote, you pick 2 items from their selection, and they surprise you with 5-6 things in your tote. Sign up with my referral link if you’re interested! 4. Le Tote – A fabulous clothing rental service! Add what you like on their website to your closet and they’ll ship you as many “totes” as you can get in a month for $49. Oh, and they also include jewelry! You’ll get 3-4 clothing items and 2 jewelry pieces in every box. Items tend to be high quality and work appropriate. I’ve received knee-length skirts, little black dresses, and silk tops. Keep items you really love and you’ll get a 20% discount. Sign up with my referral link and use code “LETOTESTYLE31” to get $10 off! 5. StitchFix – I haven’t had great luck, but others have! You do have to pay a $20 styling fee if you don’t keep anything, so it’s a bit risky. But, if you do love what you get, it goes towards the items in your fix. If you try them, I’d recommend linking them to a super specific Pinterest board and leaving specific comments about what you’re looking for! Sign up with my referral link or view my past reviews from June or November. 7. Facebook groups – If you’re not opposed to used stuff, I’m a member of a few: Shameless plug for my own: Shop My Closet. Also, Aren’t You Beautiful is a great one! Just make sure you’re sending any funds “Goods/Services” and/or backed with a credit card so you’re protected from being swap lifted in any group. You never know these days, but most people are honest. 8. Flash Sale Sites – My very favorites are Hautelook (owned by Nordstrom) and MyHabit. I also have purchased from RueLaLa and Ideel (formerly ideeli) before with great luck! I’ve heard good things about Zulily also. 9. Secondhand Online – Similar to ThredUp above, Twice is another favorite, I bought a basically brand new sweater from Urban Outfitters for less than $10 around the holidays last year. (Sign up and get $20 credit with my referral link.) Tradesy is also another new find for me – so many great deals on designer and higher end brands! (Sign up and get $25 with my referral link.) If you’re dying for something super high-end but want it for half the price, stalk The Real Real. 10. Discount Retailers – Did you know TJ Maxx is online now? So is Nordstrom Rack, Saks off Fifth, and Neiman Marcus Last Call! Take the horrible shopping racks out of the equation and just shop it online! Everlane: Everlane is for Basics. Love their U-neck tees ($15) and really want that silk blouse ($85) too! Much better prices than comparable basics. Forever 21: Because, duh. So cheap. Don’t care that I’m not 21, they still have some good finds. Kohl’s: Don’t be fooled by the lackluster store experience, their LC Lauren Conrad and rotating DesignNation lines are great. I also love the shoes by Simply Vera Vera Wang! They also have coupons ALL THE TIME. Simply Chic Boutique: This boutique is local to me (Bellevue, holla!) but they sell online now too! …And if you’re doing all this online shopping, be sure you’re getting cash back for your purchases! Ebates is my personal favorite, get from 2-10% back for your purchases. I also have been known to use Mr. Rebates for some shops that aren’t supported by Ebates. Don’t forget to check and see if your credit or debit card offers cash back while shopping online too! Another tool to add to your arsenal is Shoptagr. I use it to keep track of items I love but haven’t gone on sale yet. (Yeah, I’m that girl.) They’ll send you email alerts anytime an item on your list drops in price, and even includes any applicable coupon code(s) you’ll need. 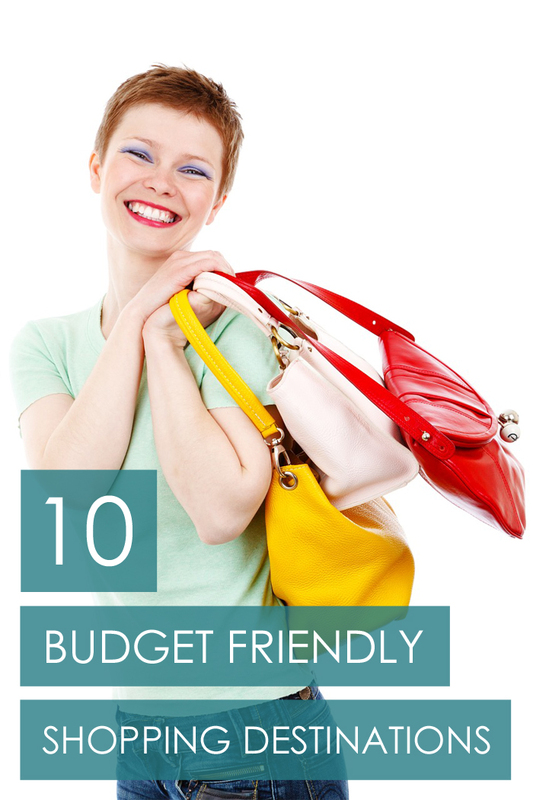 Where are your favorite places to shop that fit within your budget? Awesome compilation! I actually shop at several of these places, though none of the online ones as of yet. I haven’t had great luck with clothes fitting from shopping online but accessories heck yes! Haha, I have the same problem with online shopping, but I love that so many places are offering free return shipping or in store returns now. Makes it that much easier! Oh this is priceless, thank you for sharing!! Definitely will be taking a look at all of these! I’ve started using some of your suggestions, including GroopDealz!! I was so excited when I saw TJ Maxx was online now!! Also, I’ve heard good things about ThredUp. I need to utilize it more often! Yeah, ThredUp is definitely a bit of a treasure hunt but you can definitely score some good stuff! I suppose it’s not much different than TJ Maxx in that regard though! SO much information here! Wow. I’m bookmarking for sure! Haha I know right? Basically everything is eternally discounted, and you’re right, you have to wade through a bit of stuff but they definitely have some good finds! ebates was easily the best thing I ever did to facilitate my online shopping addiction. I always thought it was too good to be true when I saw the commercials.. I love that you get 7.5% back at ThredUp too! such an incentive. I know, seriously so true! It’s a little scary how much money I get back quarterly, but it makes it so much easier to shop online when you’re getting something back! This is an awesome list! I love using FatWallet for cash back, and I love shopping at a lot of the places you mentioned, plus J Crew Factory and regular old Nordstrom Juniors, which has amazing prices. You’d actually be pleasantly surprised by Amazon’s selection too- I scored leopard Kate Spade for a steal this spring, love love love! I haven’t tried FatWallet, I’ll have to look into that one too! Yes, love J Crew Factory and Nordstrom BP too! I forget Amazon has fashion but you’re right – I picked up my Rebecca Minkoff bag and Kate Spade wallet there for 30% off last spring! It’s very surprising, def not the first place you think of! I love Lauren Conrad’s line! Bargain shopping is the best. Glad you liked the suggestions, Summer! I like this list because it has so much variety–definetly something for everyone! I used to be a big fan of ruelala but started sending their emails to junk mail bc it was too tempting to see a “sale” everyday :( but I am a sucker for getting the items I’ve set my eyes on so I will be checking out Shoptagr. Thanks for the recommendation!! HA! You are so brave for doing a no-buy. I just can’t right now, too much cute fall stuff out there! TJ Maxx, Nordstrom Rack, DSW, and Marshalls are my favorite! And, surprisingly, sometimes Costco has some really good finds! Oh I haven’t shopped at Costco for clothes in years! I’ll have to check it out next time.